A report calling for the elimination of second-term freshman pass/no-credit grading will be introduced at the Feb. 15 faculty meeting, according to Dean for Undergraduate Education Margaret L. A. MacVicar '65. The document also proposes a system under which students would be able to take one credit/no-credit subject per term beginning in the second term of the freshman year. The Report of the Committee on the First-Year Program is one of three reports that will form the basis for this spring's discussion of educational reform, MacVicar wrote this week in a letter to all undergraduate students. The other two documents were written by an ad hoc committee of the Student Committee on Educational Policy, and by the Science-Engineering Working Group. After an intensive period of discussion and debate, the faculty will likely be asked to vote on parts of the SEWG and CFYP reports at its April 19 meeting, according to MacVicar. The CFYP proposal was first publicized last spring when it drew heated criticism from many students at two open forums that the committee held. In response to that criticism, the committee modified its document slightly. Undergraduate Association President Jonathan Katz '90, who opposes the CFYP plan, said that it would require a substantial effort in order to block passage of the proposal. Copies of all three reports were mailed to the UA, SCEP, and The Tech last Friday by MacVicar. The committee, which is chaired by Professor Kenneth R. Manning, calls for elimination of both second-term freshman pass/no-credit grading and the two-subject pass/fail option available to juniors and seniors. O+ Students would be allowed to take at most one credit/no-credit subject per term, for a maximum of seven classes. O+ Credit would be given only for grades of "C" or better; the current pass/fail system gives credit for "D" work. O+ At most two credit/no-credit subjects could be used to satisfy the Humanities, Arts, and Social Sciences requirement; at most two such subjects could satisfy the Science Core and Science Distribution requirements; and at most one could satisfy a departmental requirement. The CFYP report argues that second-term pass/no-credit should be eliminated because many freshmen presently use it to take extremely heavy loads, neglecting subjects that serve as the basis for later studies. The committee points out that 45 percent of second-term freshmen took more than 55 units in a recent year while only 12 percent of sophomores did so. Katz, who is the student member on the CFYP, disputed the committee's assumptions. The committee operated on the belief that students were not working hard enough, Katz said. He did not believe this was the case, and also suggested that students who felt confident enough to take 55 or more units could probably handle it. At one of the forums held last April, some students suggested that a lower freshman credit limit could solve the problem of overloading. The committee debated this alternative but rejected it because it would impose a credit limitation on all students for the benefit of only those who need it, and because it would not address the committee's other concerns. Among those concerns were removing the artificial barrier between the first and second undergraduate years imposed by pass/no-credit, and encouraging students to adopt flexible academic programs that might allow them to extend completion of core science requirements into their second year. The committee also hoped that the proposed system would allow students to explore areas of interest throughout their undergraduate years. Katz doubted this would be the case. Students who wish to go to graduate school or find employment will be reluctant to use the credit/no-credit option for classes in their major or related to it, he said. Companies and graduate schools may suspect that students who elect to take subjects credit/no-credit are likely to have done poorly, Katz said. Katz criticized the evidence offered by the CFYP for its conclusions. The report is very "anecdotal," he said. Even though MIT has a large number of people who could compile and analyze statistics on student performance, this was not done. Moreover, "data that would not support their point of view is not included," he said. Manning could not be reached for comment yesterday. The CFYP report also recommends that more flexibility be introduced into planning for the first-year program. The proposed credit/no-credit system would be one method to encourage a more flexible program, since it would allow students the option to postpone taking science core subjects and to explore other academic interests. More generally, the report recommends that the Institute adopt the following view: "That the general expectation of the Institute is that freshmen will complete the Institute mathematics requirement and two of the three remaining core science subjects, along with two HASS subjects, during their first year." Presently, the vast majority of freshmen complete all five science core subjects and two HASS subjects during the first year. At the same time, the committee explicitly does not preclude students from following the current norm or arranging even more flexible academic programs. 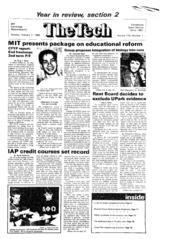 The proposal encourages, for example, students who have no calculus background before coming to MIT to postpone taking Physics I (8.01) until second term freshman year, after having taken Calculus I (18.01). In addition to the credit/no-credit system, the committee also recommended that faculty and Institute support offices encourage the view among freshmen that they are free to tailor their programs to their individual needs. Furthermore, the report urged the development of curricula along these lines.